It is May 1918, war is sweeping Europe, and a group of boys await graduation in their near-deserted town. Drawn close by an unspoken fear of leaving home to fight, they retreat into a clandestine world of codes, hideaways and fierce invention - until one day a stranger enters their lives and their secret is exposed. One of the things I love about Sandor Marai's writing is the ease at which the reader can sink into his prose. 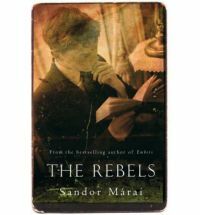 His writing is so evocative that every story I've read of his really comes to life on the page - and The Rebels is no exception. This was a great story that captured both the period setting and that moment when one ceases to be a child and becomes an adult. The boys in the gang are all so distinct and yet eerily the same and the reader can feel the fragility of their bond throughout the book. I've read four of his books now, but sadly there are only two more left for me to read in English. Luckily, others are available in German, so I will at least be able to continue reading his work. I hope that more are released in English soon so that others can enjoy this great writer. This is a worthy addition to the library of any literary fiction fan.